Acrybase S is a solvent-based primer for acrylic or similar products. 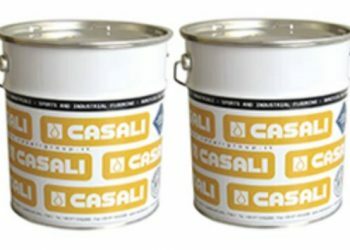 Acrybase S is generally used as a primer on bituminous membranes and metal decks to prepare them for the adhesion of acrylic or cement waterproofing systems such Acryroof Plus and Dermacem. 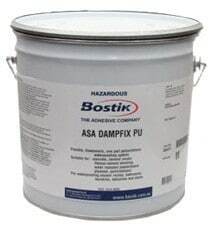 Dermaprimer is a primer for bituminous waterproofing materials such as prefabricated membranes, liquid membranes and hot bitumen. Derma primer consists of bitumen in solution, with solvents regenerated by distillation; the product is fast-drying and adheres to any surface. 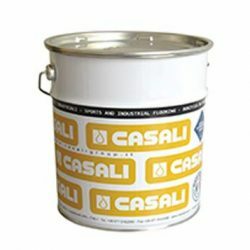 Dermaprimer may also be used to coat and protect ferrous materials such scaffolding, tanks, pipes, structures etc. 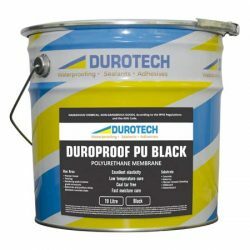 Dermarubber S/P is a highly elastic waterproofing liquid (1000%) thanks to its formulation with bitumen in solution elastomerised with special molecules. The product contains a special root-stop product that protects…. Polyroof is a thixotropic or self-levelling two-component polyurethane drive over liquid membrane. Polytop is a solvent-based two-component polyurethane finish for the protection of polyurethane and epoxy liquid membranes. 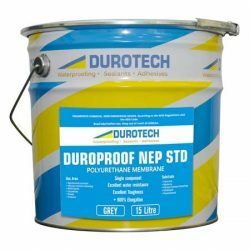 DUROPROOF NEP STD is a high quality, superior performance single component liquid that cures to rapidly to form a polyurethane membrane that is tack-free, high modulus tough and flexible. For non exposed use only.